Carter’s El Dorado Hills location offers so much more than just carpet cleaning. The team at Carter’s also specializes in all types of hard surface cleaning, including steam cleaning for tile. Carter’s also offers a VLM (very low moisture) cleaning for your wood floors. These unique cleanings can really get your hard surfaces looking like new again. Even with regular cleaning, grout lines can become discolored because soil settles into the tiny, porous holes in grout. A steam cleaning for tile will help remove soil by using steam and vacuum, which pulls the soil out of the porous grout instead of just moving it around. Think about mopping your tile floors. You use water, cleaning solution and a mop to wipe the surface of the tile, but the mop doesn’t lift any of the soil that builds in the grout lines. That’s were steam cleaning for tile can make a significant difference in the look of your grout lines. It’s really the combination of the steam and vacuum that make the biggest difference with a steam cleaning for tile. High-pressure steam is sprayed into the porous grout lines to lift and loosen the soil. At the same time, vacuum pulls the water and soil out into a waste tank on the powerful Carter truck. Clean grout lines and sparkling tile will be all that remains! 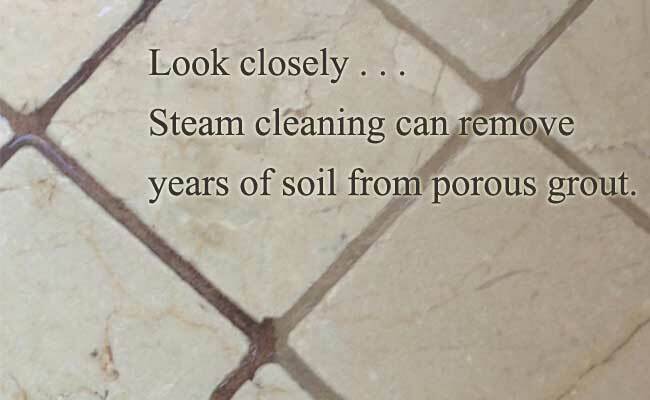 With Spring just around the corner, start thinking of steam cleaning for tile to get your floors back into shape! Keep in mind that Carter’s offers may types of steam cleaning services including carpet cleaning, area rug cleaning and even cement floor cleaning. The Carter team also has the knowledge to strip wax off wood floors and tile floors. Call now to find out what Carter’s can do for you, 916-933-7807. Carter’s Carpet Restoration provides the best Cameron Park carpet cleaning! There isn’t better carpet cleaning service in Cameron Park, guaranteed! With Carter’s, you always get the deepest green carpet cleaning and the fastest dry time available! Carter’s uses state of the art carpet cleaning technology, superior VORTEX truck mounts, and rotary extractors to give you the best Cameron Park carpet cleaning available. There’s no doubt about it: Carter’s delivers the Best Cameron Park carpet cleaning. You will experience the best customer service from your technicians. In turn, they deliver the best results from superior carpet cleaning technology. Plus, Carter’s charges by the square foot; not by the room. So, you only pay for what we clean. Remember, Pet Odor Removal uses a special carpet cleaning technique and treatments. As you might expect, this involves a separate and reasonable fee. Do you have pet odor concerns? If so, please call or read more about your pet odor removal and treatment options. First, uniformed technicians meet you at your door. They wear name badges, and they arrive in a large carpet cleaning truck. You can trust that all Carter’s technicians passed their thorough background screen. Further, the IICRC certifies each tech in carpet cleaning. Before they begin, your technicians measure your target carpet cleaning area. Next, they offer treatments and provide you an exact price. At this point, you may consider options or simply approve the cost. At this point, your technicians go to work! Carpet Cleaning – Your Satisfaction Guaranteed! The best Cameron Park carpet cleaning begins with pre-treatment. First, the techs apply a cleaning agent to your carpet to help loosen dirt, dander, and soil from the carpet fiber. Second, they may agitate the pre-treat with a carpet brush, gently working the solution through the carpet’s fiber. Next, they will clean your carpet with a HOSS-700 rotary extractor. By connecting the extractor to the truck, your techs access the highest-temperature steam and deepest vacuum power available in Cameron Park. Meanwhile, the truck supporting your carpet cleaning may seem loud. After the cleaning, your techs hand groom your carpet to give it a lush look and feel of nearly-new carpet. In addition, they may place large air movers to help speed the drying time. Finally, your technicians ask that you walk through your home with them. This way, they can make sure you are satisfied with the best Cameron Park Carpet Cleaning! Carter’s Carpet Restoration proudly offers steam cleaning services to the small town of Rescue, CA. Dean Carter’s wife, Karen, grew up in the small town of Rescue, CA, so they are familiar with this little place in the Sierra Nevada Foothills. If you’re a resident of the community and you’re looking for a carpet cleaning in Rescue, CA that you can trust, just give the Carter’s a call. They offer the deepest cleaning around – it’s sure to get that famous red dirt right out of your carpet! Be aware, you won’t get a $99 special when you choose Carter’s. 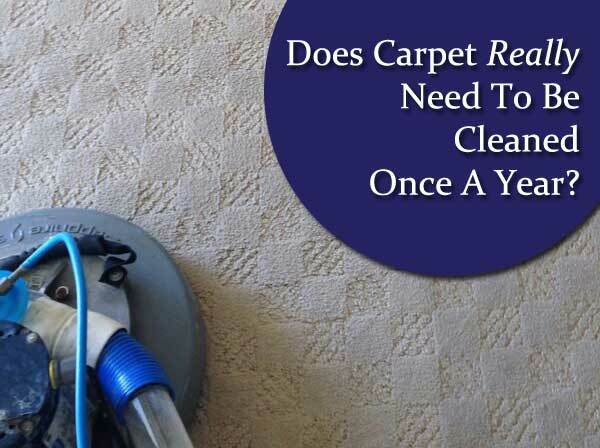 What you will get is the deepest carpet cleaning in Rescue, CA! You’ll also get personal service when you call to schedule your appointment. On the day of your carpet cleaning in Rescue, CA you will be greeted by friendly and professional technicians who will be respectful while working in your home. You’ll be left with clean carpet that is dry to the touch when your technicians leave. And you’ll be glad you chose Carter’s instead of a franchise carpet cleaning company. Carter’s is a locally owned, and family run business. The Carter family is directly involved in the daily operations of the business, in fact it’s usually Dean or Karen who will schedule your appointment. All the technicians are highly trained, background screened and professional. In fact, you can check them out on the website prior to your appointment. In addition to excellent customer service and top of the line cleaning products, Carter’s is known for their equipment. These trucks are seriously the “best of the best”. The trucks give you the highest temperature steam and the strongest vacuum power available. You get the deepest carpet cleaning in Rescue, CA and it will be dry to the touch before the techs leave your home. If you have questions or would like to schedule a free in-home estimate, just call. The number is 916-933-7807 or 530-642-9003. You’ll be glad you did! Curious about the different types of carpet cleaning? There are a variety of different ways to clean carpets. Some of the most common types of carpet cleaning include a HOST cleaning, ENCAPSULATION cleaning, DRY-CLEANING, and STEAM cleaning. These are the most common methods but you may hear them referred to by different names, including shampoo cleaning, absorbent compound cleaning, dry foam cleaning, and hot water extraction. The type of carpet cleaning that is best for you will depend upon your carpet, your environment, and a recommendation from the carpet manufacturer. Also known as an Absorbent Compound or Host Cleaning, these types of carpet cleaning uses an attractant to pull soil from the surface of your carpet. First, the carpet is vacuumed. Next, a wet absorbent compound (often resembling a wet sawdust) is applied to the carpet. Then a special machine is used to buff and agitate the compound. The soil from the carpet is absorbed into the compound, then vacuumed up. Absorbent Compound used in HOST Carpet Cleaning. STRENGTH: With this type of cleaning the carpet is dry almost immediately and it is a relatively inexpensive cleaning. WEAKNESS: A HOST cleaning has limited ability, only cleaning the surface of your carpet. With severe soil or urine deposits, this method may not be the most effective choice. Additionally, poor vacuuming can leave some of the compound (sawdust) in your carpet. This method of cleaning is mainly used for low pile, commercial grade carpet. First, the carpet is pre-treated with an encapsulating cleaning solution. Then a special machine is used to agitate the cleaning solution into the carpet fibers. As the cleaning solution dries, it forms a crystal that encapsulates (or traps) the soil deposits, which are then removed with regular vacuuming. This product may continue to work following the initial cleaning. Any remaining cleaning solution will continue to trap soil. This type of carpet cleaning is best for commercial carpet, which should be vacuumed on a regular and frequent basis. One style of machine used during encapsulation cleaning. STRENGTH: This type of carpet cleaning has a fast dry time, which allows less down-time for business operations. WEAKNESS: There is a limited cleaning ability with heavy soil conditions. This cleaning is not recommended for residential carpets. 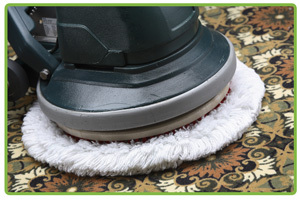 Dry carpet cleaning is also referred to as a bonnet cleaning or an absorbent pad cleaning. Contrary to their name, these types of carpet cleaning are not dry. First, a liquid cleaning solution is sprayed onto the surface of the carpet to attract soil. 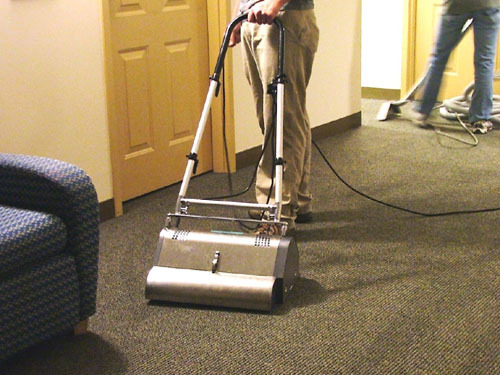 The cleaning solution breaks down the soil deposits then a buffing machine is moved across the surface of the carpet. The buffing machine has a removable, highly absorbent pad or bonnet on the bottom. This absorbent pad soaks up the cleaning solution and removes the soil deposits in the process. When the pad is soiled, it is exchanged for a fresh one. This process continues until the surface of the carpet appears clean. Bonnet on a rotary extractor used in Dry Carpet Cleaning. STRENGTH: Very little water is used with Dry-Cleaning, and there is a fast dry time. WEAKNESS: There is a limited cleaning ability for heavy soiled areas or urine deposits. There is limited extraction capability with Dry-Cleaning, meaning no vacuum is used to remove sub-surface soil. Additionally, this cleaning can be hard on face fibers. The technical name for this cleaning is a hot water extraction or HWE. Most carpet manufactures recommend this type of carpet cleaning. In fact, one of the largest carpet manufactures state that any other cleaning method may void your warranty. First, the carpet is pre-treated with a cleaning solution that helps break down the soil deposits. Then the soil and the solution is thoroughly rinsed from the carpet with a pressurized, hot water rinse. At the same time, a powerful wet vacuum is being used to remove the steam, soil, and cleaning solution. The dirty water is deposited into a waste tank. 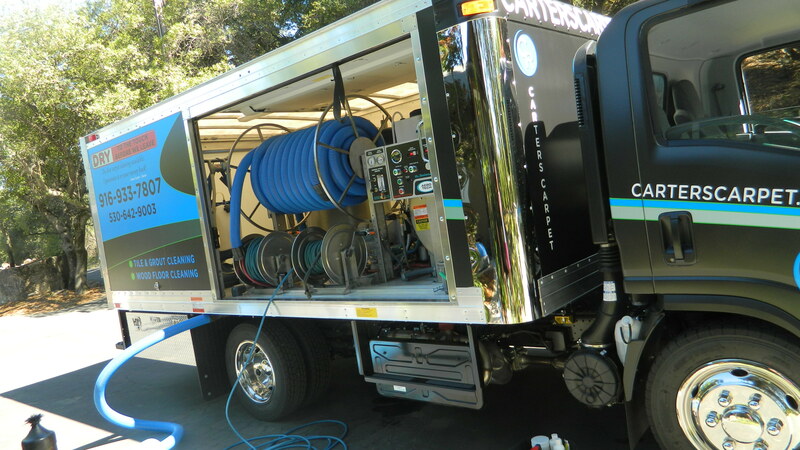 Most professionals use a truck mounted unit which offers higher temperature water and stronger vacuum power. There are also portable steam cleaning units that operate with the same principles. The downfall of portable steam cleaning units are reduced heat, water pressure, and vacuum resulting in inferior cleaning. Truck mounted steam cleaning machine. STRENGHT: Steam cleaning offers strong rinsing that removes imbedded soils. Additionally, the high-temperature water which can helps sanitize and disinfects carpet fibers. WEAKNESS: When steam cleaning is done correctly there are very few, if any, weaknesses. You’ve got area rugs and they may be ready for a Cameron Park Area Rug Cleaning. Rest assured, you can trust your rugs with Carter’s Carpet Restoration. Carter’s has been cleaning area rugs in Cameron Park and the surrounding areas for over twenty-two years. From family heirloom carpets to Oriental and Persian rugs, Carter’s will provide you with a deep and gentle Cameron Park Area Rug Cleaning. Wall to wall carpeting is on it’s way out, and area rugs are the new “green” of the carpet world. Home owners are opting for hard surfaces like tile, stone and wood to cover their floors. Gorgeous area rugs can now be found on top of those hard surfaces. It’s just a change in style that Carter’s has certainly been staying on top of, in the way of cleaning all the unique and beautiful rugs out there. Carter’s offers a variety of Cameron Park Area Rug Cleaning choices to meet your needs and the unique needs of your rugs. You can choose from in-home synthetic rug cleaning or in-shop wool rug cleaning. Each rug is treated according to it’s unique needs. Carter’s is even offering a specialized “trough cleaning”. This extremely gentle, but very effective cleaning is typically used for severe soil or urine situations. Before you make the call to find our more about Cameron Park Area Rug Cleaning, take a few moments to review the questions below. Knowing the answers to some or all of these questions can help Carter’s determine what type of area rug cleaning will be best for your carpets. Do you know what your rug made of? Is it synthetic, wool, or silk? Do you know the size of your area rug? Does the rug contain urine or severe soil deposits? Would you prefer to have the area rug cleaned in your home or in the shop? If you prefer the in-shop cleaning, will you be delivering your area rug or would you like it picked up by a Carter’s technician? Again, knowing the answers to some of these questions will help Carter’s determine the preferred Cameron Park Area Rug Cleaning method. Ready to schedule an area rug cleaning or just want to learn more? Use the contact form or call now, 530-642-9003. What’s involved in the Carpet Cleaning Process? New to having your carpet cleaned? Or maybe you’re just wondering about the carpet cleaning process? Here’s a simple step-by-step of what it would be like to have a high-end carpet cleaning process in your home. Click here, if you’re wondering how to prepare for a carpet cleaning appointment. First, your technician would respectfully greet you at your door and introduce himself by name. You’ll notice that he is in uniform and wearing a photo ID badge. At this time he will introduce his assistant and ask what you’ll be having cleaned. Expect to walk him through your home and show him any areas that you may be concerned about including pet odor issues and stains. Your technician will inspect your carpet closely and he will listen intently to any questions you may have. Next, your carpet cleaners will take measurements of the areas that you want cleaned. As the cleaning assistant totals up the square footage, your lead technician will be explaining the cleaning process in detail. At this time you will be given a total price for the carpet cleaning. Then the cleaning assistant will begin preparing for the carpet cleaning process. He will begin by bringing all supplies and tools to the door. The first item put down will be a walk-off mat to keep your home protected during the carpet cleaning process. Other supplies include vacuum hose, solution line, air movers, pre-treatment sprayer, carpet brush or rake, corner guards, a cleaning wand and the rotary extractor. Now your carpet cleaning process will begin. Your carpet will be pre-treated to help loosen all the dust and dander on the carpet fibers, then cleaned with the rotary extractor. After the cleaning, your technician will hand-groom your carpet and uses a high-tech air mover to dry the carpet. When complete, you’ll be asked to do a walk through with your carpet cleaner to ensure your satisfaction. Payment is taken when the work is complete and you are 100% satisfied. Your technician will also inform you about a follow up call that you will receive within a week, to make sure you are still happy with your carpet cleaning process. Now all that’s left to do is schedule your appointment! For years Carter’s Carpet Restoration has been consistently voted best carpet cleaning. Since 1989, Carter’s Carpet Restoration has been offering the very best carpet cleaning to the residents of El Dorado County. Several years ago, Carter’s Carpet Restoration expanded their service area and began providing Folsom Carpet Cleaning, Granite Bay Carpet Cleaning and serving the Roseville Area. Carter’s Carpet Restoration is consistently voted best carpet cleaning due to their superior dry-steam cleaning method and amazing dry time. Carpets are actually Dry-To-The-Touch before the technicians leave your home! Residents of El Dorado County have given the Best Carpet Cleaning award to Carter’s Carpet Restoration for eight years running! Carter’s is proud to serve the residents of the Western Slope providing Placerville Carpet Cleaning, Cameron Park Carpet Cleaning and El Dorado Hills Carpet Cleaning. Since 2009, readers of the Folsom & El Dorado Hills Style Magazine have been voting Carter’s Carpet Restoration best carpet cleaning! The above link takes you to the page with all the 2014 winners. To see Carter’s Carpet Restoration, you will have to scroll down the page a bit. In 2014, Carter’s was voted best carpet cleaner by the citizens of Folsom! Thanks Folsom residents! Since 1998, Carter’s has been a upstanding member of the local BBB, consistently maintaining an A+ rating. No complaints, no disputes, just honest carpet cleaning. For Carter’s Carpet Restoration it is a huge honor to be voted best carpet cleaning by this community! Carter’s Carpet Restoration takes carpet cleaning seriously. From educated and professional technicians, to superior cleaning products, and the best cleaning machines made – you can trust that your carpet will be cleaned correctly by professionals. There’s a reason that Carter’s is consistently voted best carpet cleaning. If you’re looking for a company that you can trust to do the job right – call today! 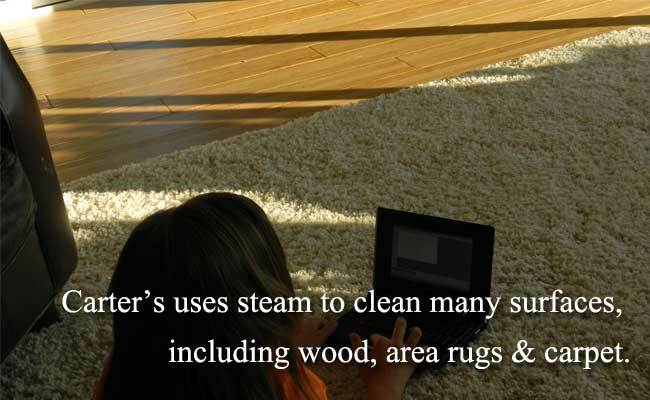 You will find out what a makes Carter’s different from other steam cleaning companies. You’ll be glad you called! 916-933-7807 or email. Does carpet really need to be cleaned once a year? The quick answer, YES. And sometimes even more often than once a year. Here’s why . . . It’s a fact, soil and oil build up on your carpet fiber. Sometimes you can see it, when spills or accidents happen. For many of us, it’s gradual and you don’t really notice it. For others it all comes at once, when the dog runs through with muddy paws! No matter what happens in your home; soil, dust and dander settle on your carpet. Even in the rooms that are rarely used. For example, the formal living room or the guest bedroom get minimal traffic but dust is everywhere and it settles nicely into your carpet fibers. On a side note – this is why carpet can actually be better for people with severe allergies than hard surface flooring. The dust settles into the carpet and isn’t floating around. On a hard surface like tile or wood, the dust is easily disturbed and remains more present in the air. Anyway, if the soils and oils are not removed, they gradually settle deeper causing friction and wear. The tiny pieces of soil rub on the delicate carpet fiber and cause it to break down or make tiny cuts in it. Think of it like a piece of sand in your shoe – an irritant. This process is not immediate, in some cases it can take years to wear down a good quality carpet. In other cases, damage can be done quickly. But if you let your carpet get to the point where you’re seeing soil then it’s probably overdue and ready for a steam cleaning. Most carpet manufacturers recommend a steam cleaning or hot water extraction once a year. So, does carpet really need to be cleaned once a year? 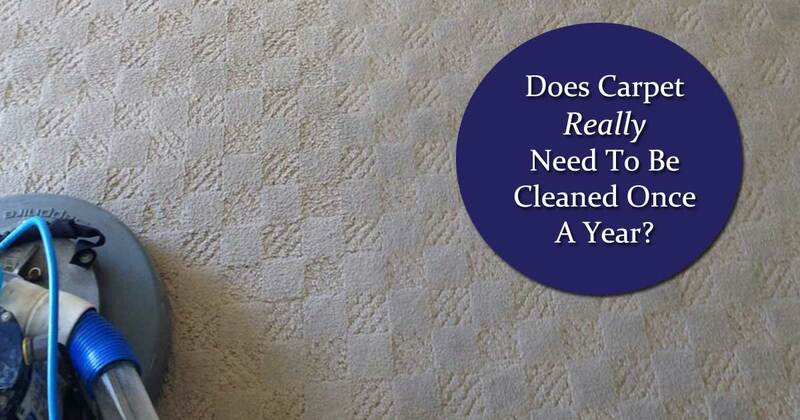 The answer is yes, if you’re looking to get the most life out of your carpet then take good care of it before it begins to show signs of soil and wear. And vacuum often! 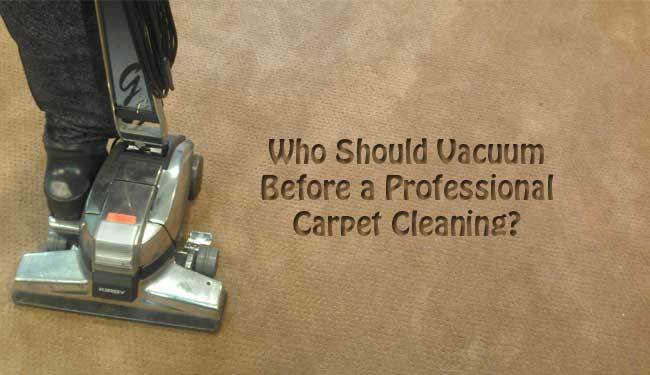 Who Should Vacuum Before a Professional Carpet Cleaning? Carpet should certainly be vacuumed prior to a professional carpet cleaning. A pre-vacuum removes dry soil, surface dust, and dander so you get a deeper cleaning. But should you vacuum before a professional carpet cleaning? Or should the carpet cleaner take care of the vacuuming? In short, YOU should vacuum. Read on to learn why . . . The simple reason for this post is that some consumers prefer that their carpet cleaner do the vacuuming before their professional carpet cleaning. The opinion of this business is that YOU should vacuum before a professional carpet cleaning, with your own vacuum cleaner. To put it simply, you do not want something from another home transported into your home via a traveling vacuum cleaner. Unfortunately, many homes may not be as clean as yours. And realistically, you’d like to keep it that way. A traveling vacuum, or a vacuum that a cleaning service brings from home to home, may be transporting bacteria, germs, fleas, and even urine deposits with it. Most vacuum cleaners have brushes that touch and agitate the surface of your carpet. They pick up and remove soil, dust, and dander from your carpet’s surface. They also pick up microscopic debris, which can live on the vacuum’s brushes. Additionally, if fleas are sucked up into the vacuum bag at the previous customer’s home they could now be in your home. To avoid this type of situation, just vacuum with your own machine. Yes, vacuum before a professional carpet cleaning. In short, yes, carpet should be vacuumed before a professional carpet cleaning and YOU should be the one to take care of the cleaning. You will ensure that you’re keeping your home cleaner and that germs, fleas, and urine are not being brought into your home via a traveling vacuum. The extra 20 minutes it takes you to vacuum before a professional carpet cleaning will certainly be worth the peace of mind. Happy cleaning!